A few weeks ago I wrote a piece arguing that Ayn Rand’s remarks condemning Nixon’s meeting with Mao are applicable to President Trump’s summit with North Korean leader Kim Jong-un on June 12. I didn’t expect everyone to agree. But what was shocking in the days that followed was the unalloyed confidence with which some of Trump’s supporters quickly predicted that because of the meeting, North Korea would abandon its nuclear weapons as a result of a few handshakes. Some Trump supporters even called for a Nobel Peace Prize for Trump. So far, in the month since the summit, the balance of evidence suggests that Trump’s meeting has done little to stop Kim’s nuclear program, though it did provide Kim with ample material for propaganda. Knee-jerk defensiveness and double standards together reveal a malignant trend in American politics. The unreflective readiness with which Trump’s supporters defend the summit is just one of many symptoms of a more general phenomenon that others have begun to note, without appreciating its significance. 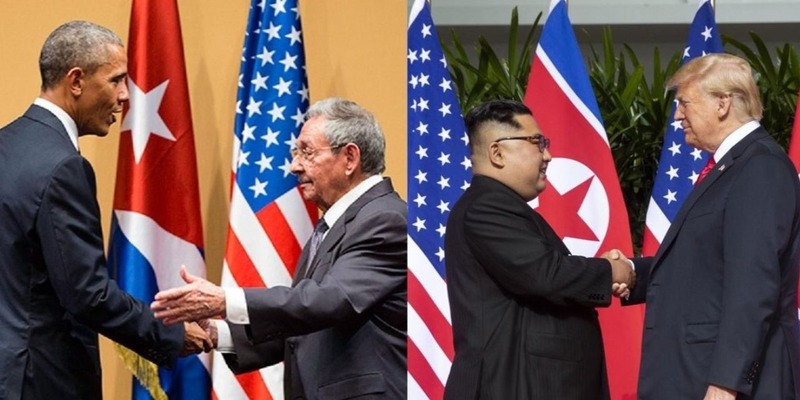 Another symptom is the double standard these supporters apply to the Trump-Kim meeting in comparison with Barack Obama’s meeting with Raul Castro in 2016. The knee-jerk defensiveness and double standards together reveal a malignant trend in American politics. Americans are becoming less principled and more tribalistic. When Obama went to Cuba to meet with Castro, Newt Gingrich called Obama “the first anti-American president” for posing with Castro in front of a picture of Che Guevara. But Gingrich calls the Trump-Kim meeting “historic” and hails Trump for having “accomplished more on North Korea than Presidents Clinton, Bush, and Obama combined.” The Daily Show assembled a montage of Sean Hannity remarking on both Obama and Trump, saying that Obama was “catering to the world’s dictators” and was “literally the Neville Chamberlain of our time,” but that Trump deserves a lot of credit for talking to Kim, and that there was no downside to the meeting. The double standard is especially apparent among Trump’s staff. Secretary of State Mike Pompeo condemned Obama for giving the Castro regime “a huge public relations coup,” but then effusively assisted Trump in delivering the same kind of coup to the Kim regime. National Security Advisor John Bolton, who made his name as an opponent of the appeasement of dictators, called Obama’s “enormous” concessions to Castro a “tragedy for the Cuban people,” but still (reluctantly) joined Trump in shaking hands with Kim, and has now downplayed critics who say that Trump is too accommodating to dictators. Many other commentators attribute some kind of hypocrisy to those cheering Trump’s summit. At the same time, Trump supporters just as easily accuse those who cheered Obama’s visit with Castro of being hypocrites for criticizing Trump. They could both be right. By contrast, consider an example of what it looks like to take a principled stand. Yaron Brook of the Ayn Rand Institute condemned Obama’s meeting with Castro back in 2016, and by the same standard, ARI today condemns Trump’s meeting with Kim. In each case, the meetings granted moral legitimacy to evil regimes. By contrast, unprincipled thinkers evaluate the world on a case-by-case, ad hoc basis. They might rely on double, triple, or quadruple standards. This really means not having any standards at all. Any standards they invoke are just after-the-fact rationalizations or attempts to distract or deflect from criticism. I saw a number of social media commenters engage in special pleading to this end when they claimed, quite implausibly, that the only alternative to negotiating with Kim is all-out nuclear war. Today’s major political camps are moved by loyalty to some group, rather than by commitment to an ideological principle. Red herrings like this are among the best arguments I could find. I could scarcely find any serious article trying to explain why Trump was justified in meeting a dictator while Obama was not, certainly not from the pundits or politicians who employ the most glaring double standards. Likewise, I couldn’t find any arguments for the position that praises Obama but condemns Trump. The point is not that it’s impossible to give such an explanation; the point is that virtually no one of any prominence even tries. My colleague Elan Journo points out that to call these politicians hypocrites is to give them too much credit. Hypocrisy means advocating some idea but failing to act on it. For most politicians these days, it’s not clear that there is some idea they advocate in the first place. They simply utter statements about particular people and policies that have not a glimmer of principled consistency. The reactions to the Trump-Kim summit underscore the devastating extent to which today’s major political camps are moved by loyalty to some group, rather than by commitment to an ideological principle. Politicians and pundits in the same camp condemn one meeting with a dictator but praise another, not because the dictators have changed, but because the team running the White House has changed. People root against Obama’s team and for Trump’s, and vice-versa. This was especially clear when Trump’s fans went from cheering his bellicose rhetoric about “fire and fury” and the size of his nuclear button in September of 2017 to cheering his olive branch to Kim a mere six months later. It’s not as if North Korea became more or less threatening in the space of that six months. The only thing consistent is the personality they cheer, not any principle he stands for. This is political tribalism. Many recent commentators from across the political spectrum are noting the increasing tribalism in American politics. But few have yet noted the distinctive indifference of tribalists to moral principles. Ayn Rand did note it. She wrote a great deal on the topic of tribalism, enough that in November, we are devoting an entire student conference to her views on the topic and its impact on the life of an individual and the culture. It is the fundamentals of philosophy (particularly, of ethics) that an anti-conceptual person dreads above all else. To understand and to apply them requires a long conceptual chain, which he has made his mind incapable of holding beyond the first, rudimentary links. If his professed beliefs—i.e., the rules and slogans of his group—are challenged, he feels his consciousness dissolving in fog. . . . While America’s founders were the first to establish a nation based on a philosophical commitment to individualism, their achievement has always struggled against the ancient forces of tribalism the country inherited from the Old World. But lately there has been a pronounced upsurge in anti-ideological tribalism in U.S. politics featuring a disturbing indifference to moral principles. There has been a pronounced upsurge in anti-ideological tribalism in U.S. politics featuring a disturbing indifference to moral principles. Consider one telling contrast. Since at least the 1960s, many Republicans have claimed to be ideologically opposed to communist dictatorship. Ronald Reagan called the Soviet Union an “evil empire” and at least bothered to speak up for the rights of the oppressed, even as he held summits with Soviet leaders. For much of the 20th century, as he and other Republican presidents met with foreign dictators, Republicans at least tried to maintain a reputation for being principled, such that rhetoric about their disloyalty to these principles still made sense. But something has changed. Trump has had precious little to say about the rights of the oppressed, and has even praised Kim, joking that he would like to have his dictatorial powers, all to the adulation of his fans. As a point of reference: when Obama visited Cuba, even he still (guiltily) made a point to meet with Cuban dissidents and condemn Cuban human rights abuses. It is somewhat encouraging that many Republicans, even reliable Trump fans like Newt Gingrich, are speaking up against Trump’s embarrassing deference to Vladimir Putin at the Helsinki summit. To question American intelligence agencies and trust a former KGB agent may be one step too far for many of them. Still others have doubled down in support of Trump with the same ebullience they had when he met with Kim. And still Sean Hannity abides in his defense of Trump. Even for those who have criticized the president, it is difficult to believe that they do so out of commitment to some genuine moral principle differentiating America from Russia—not when they’ve tolerated so much appeasement already. It’s more likely that they’ve simply reached the emotional limit for how much they can stomach. Even if a only a handful of politicians have these emotional limits, that is little reassurance. Reliance on emotion in politics is the problem in the first place, as we can see when demagogues whip up chanting crowds whose members are united by little more than their hatred for the other tribe. Some would argue that the fact that North Korea’s situation is worse is precisely what justifies negotiation, on the grounds that theirs is a hostage situation. This would be a relevant point only if the U.S. government had no alternative but to negotiate and a responsibility to negotiate for North Korean hostages. But the U.S. has many alternatives in regard to North Korea (such as containment and a blockade), and its sole responsibility is to defend the rights of its own citizens. In any case, Ayn Rand’s point in her essay “The Shanghai Gesture” was not that one should never negotiate with a dictator, but that one should not do so in a way that grants them moral legitimacy in the eyes of the world. Ayn Rand, “The Missing Link,” in Philosophy: Who Needs It (New York: Signet, 1984).